Iceland's active terrain offers adventure for outdoorsy types, while its cities offer outstanding art and culture. The worldwide economic crisis hit Iceland particularly hard in 2008, with the national unit of currency, the krona, taking a major beating. However, the island nation's recent economic woes put this normally pricey destination on the hot-travel-deals radar. 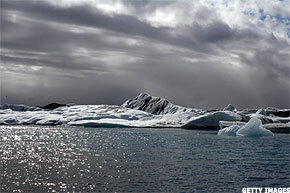 Now is a great time to take advantage of better currency exchange rates with a trip to the land of fire and ice. Population: 300,000, over half settled in the capital city of Reykjavik. Geography: Iceland is roughly the size of Ohio. Currency: The krona (plural: kronur). Language: Icelandic (formerly Old Norse) remains essentially unchanged from its Viking ancestry during their settlement here in the ninth century; most citizens also speak English. Geology: Glaciers cover over 10% of the country, and its over two dozen active volcanoes keep things interesting, earning Iceland the nickname "The land of fire and ice." Health: Icelanders are among the healthiest people on earth, with one of longest life expectancies worldwide. Flora and Fauna: The arctic fox is Iceland's only native mammal; its hallmark birch trees are also native to the island; other wild inhabitants and plants were imported from the European mainland. (Travelers will likely appreciate Iceland's lack of mosquitoes). Iceland's active volcanoes, mountains, geysers and alpine lakes make it an ideal and thrilling destination for outdoorsy travelers. Visitors familiar with the geologic wonders of Yellowstone National Park will be in hot-water heaven here: there are four national parks and other protected areas where massive glaciers meet volatile hot springs with spectacular results. Guided Jeep tours are a popular, safe way to get an up-close and personal look at the massive glaciers, and whale watching along the coastline is another must-do while visiting. Travelers of all types will also savor a visit to one of Iceland's many outdoor hot springs and pools, popular gathering places year-round. 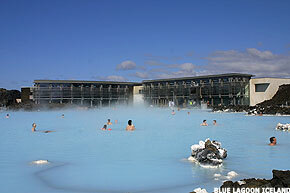 A stop at the Blue Lagoon geothermal spa is a must for many visitors. More citified travelers can eat, shop and satisfy their cultural cravings in the capital city of Reykjavik. Shoppers will find deals on lopapeysas, the traditional sheep's wool sweater that's an Icelandic cultural hallmark as well as a distinctive, wearable souvenir. Reykjavik is also where most of Iceland's many museums are located, including the Reykjavik Art Museum, housed in three separate buildings, the National Gallery and The Culture House, a museum that gives visitors a sense of Icelandic history and culture. In addition to these larger museums, there are myriad smaller art galleries and live music venues in this charming, walkable city. Foodies will enjoy their visit as well: Iceland is renowned for its abundant fresh seafood from the cold North Atlantic waters. Due to stringent agricultural standards, Iceland's lamb, poultry and cheeses are superb. Look for traditional smoked lamb ( hangikjöt) or fresh cheeses, including the yogurt-like skyr. Licorice and fine chocolate (sometimes combined) are favorite Icelandic sweet treats. Don't be dissuaded by its frigid name; Iceland's hardy citizens are active outdoors and culturally year-round. Iceland's climate is relatively mild, though certainly cooler than those who usually vacation in the tropics might expect. Winter temps hover around freezing, but only reach to the mid-50-degrees in summer. Dress in layers, as the weather can take unexpected turns any time of year. As with Alaska and northern Canada, Iceland's northern latitude means full days of sunlight in summer and long, dark winter days that often end with a light show courtesy of the aurora borealis. Flights take about five to six hours from New York to Keflavik International Airport (about 30 miles from Reykjavik). Icelandair offers year-round flights from several U.S. cities. Now is the time to check major travel portals like: TripAdvisor, Expedia and Kayak for the best flight deals. Visitors will need a current passport to travel to Iceland. Most merchants accept major credit cards, making shopping easier by foregoing trips to the bank to exchange currency. Finally, don't forget to pack European adapters for electronic devices. Svea Adventures offers small scale, eco-friendly travel tours of Iceland, including adventure tours of volcanic sites on horseback. Nordic Visitor offers Iceland vacation packages for honeymooners, families, and luxury travelers, and car rental packages for self-driving tours. Arctic Adventures provides a variety of outdoor adventures for hardier travelers, from kayaking to ice climbing to glacial hiking. Unique tours can be customized to meet luxury travelers' needs through Iceland Experience.